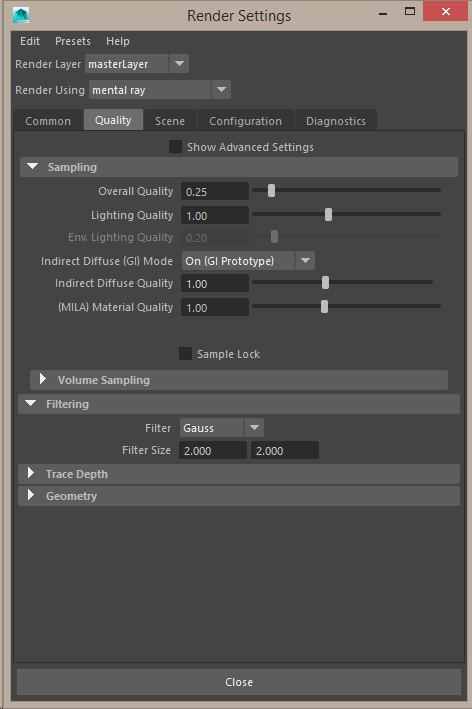 The emphasis is on simplified rendering using abstracted quality controls and global controls that are easy to find–changing how users interact with mental ray and reducing the decisions or options you might need to consider. To take the most advantage of new techniques it’s recommended you use the MILA or MDL materials and area lights (including the newly integrated object lights) when possible. Newer techniques begin to rely on the core itself to optimize the scene (Light IS, MDL, GI Next, MIS, etc.) and the use of the GPU, when possible, to speed up rendering. Note that MDL will be covered later as materials are made available. Improved convergence of Progressive Rendering. This mode now better matches progressive off. 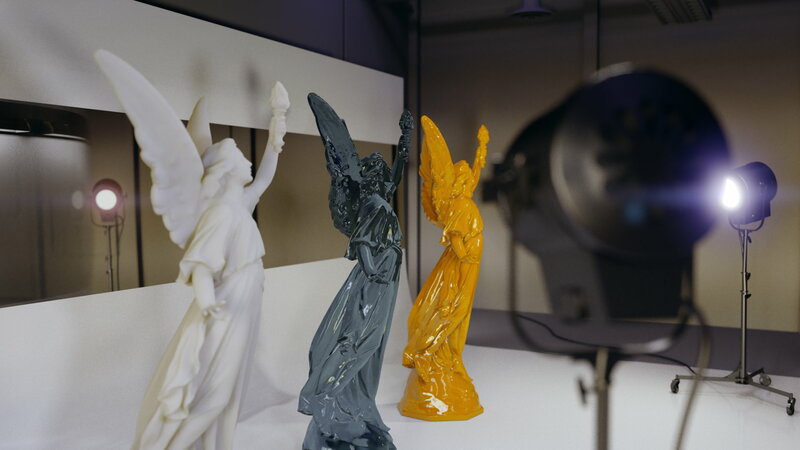 This version of mental ray offers a new global illumination engine to compute indirect lighting efficiently, and without the restrictions of the previous experimental solution GI GPU. 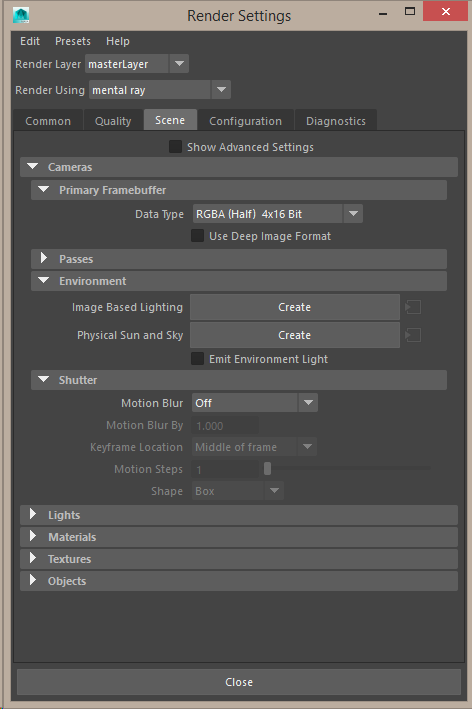 In particular, it supports motion blur and works well with custom shading effects, like lens distortion and depth-of-field, volume effects, and subsurface scattering. It covers all the indirect lighting features of the traditional Final Gathering approach, like “color bleed” diffuse-diffuse bounces even passing through transparent surfaces or seen in reflections. Caustics are currently not handled. In contrast to the traditional GI implementations, the new engine is utilizing a brute-force algorithm without any caching, to guarantee uncompromising and consistent quality in static images and in animations. This also makes it extremely easy to use. The new global illumination engine is considered a prototype in this version because it is under continuous development. It currently runs only on CPU, but is planned to take advantage of the GPU going forward. It should work reliably with typical scenes and setups, and with most third-party shaders. It can be enabled and controlled with string options and on the command line of standalone mental ray. 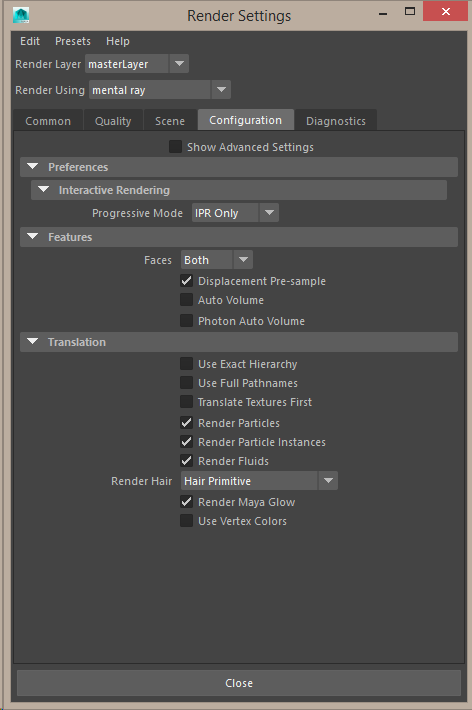 The render settings are the most impacted by integration changes. Others will progress over time, but this section has the most effect on users rendering images. framebuffers – important – notice that framebuffers are now named framebuffers with correct naming. This may take getting used-to but it is much more flexible and powerful than before. More on this later. You will also notice a checkbox for “Advanced” which exposes more controls. These will be covered later. 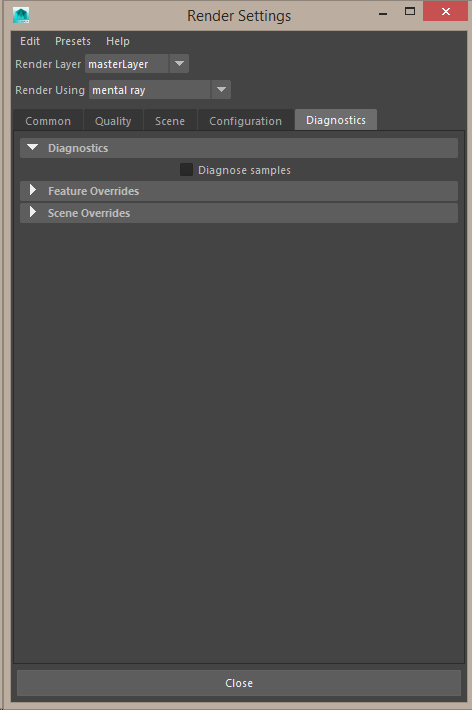 Typically this provides a little more granular control or exposes a useful legacy feature for older scenes. 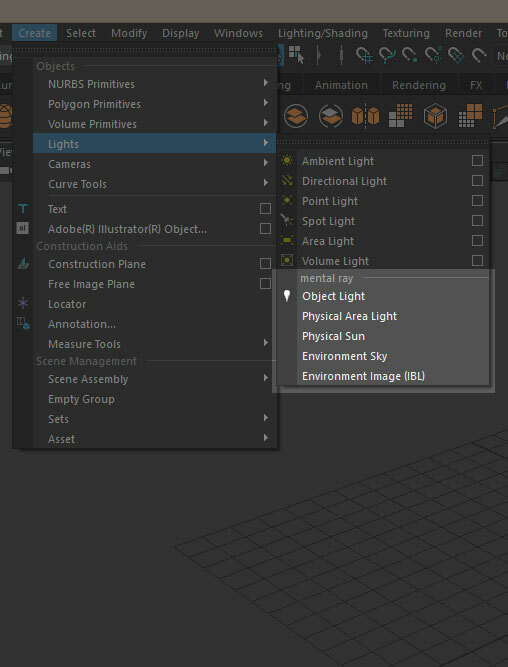 The creation menu has also added convenient ways to create common mental ray lights, including object lights. Selected objects will be turned into an object light in your scene. Area lights are also easily textured and sampled for rendering using a new light shader. Note that controls for the Physical Area Light are connected to the area light main controls. This is done so that users will begin to use the most obvious controls instead of those hidden as a light or material shader. New users will find this to be easiest while legacy users will need to adjust their workflow to simplify.